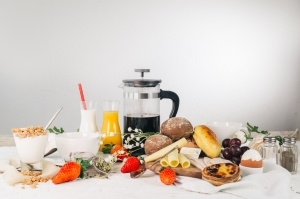 Traditional Lisbon Breakfast Delivery What if you could wake up in your rented apartment in Lisbon and receive a typical breakfast without even leaving the house? That's exactly what Breadfast offers: fresh breakfast menus, prepared every morning and delivered right at your doorstep. All you need to do is go to their website, pick your favourite menu, and start your day full of energy! Free shipping with coupon "TRIPINDICATOR". Must Try Dishes: Nothing beats their natural juice, freshly squeezed from regional oranges everyday. But if you're looking for the full Portuguese experience, you can't go without trying the Pastel de Nata! Deliveries are made between 7 am and 11 am everyday, from Monday through Sunday. 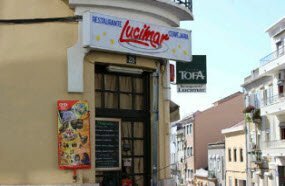 For an authentic Lisbon experience you can’t go past Lucimar, with only traditional Portugese food and nice English speaking staff. However, it is mostly only attended by locals looking for their favorite dishes at very reasonable prices; so far undiscovered by tourists. Must Try Dishes: A traditional dish of Portugal, Francesinha is a must try – but not for the faint hearted! Think, two slices of bread, four types of meat covered in cheese, with an egg cracked on top and served in a bowl of tomato-based sauce and chips. You will definitely want to be very hungry before you attempt this one. A main aspect of the Portugese culture is their music, in particular Fado, which dates back to the 1820’s, featuring a melancholy theme, achieved through singing and the use of guitars. 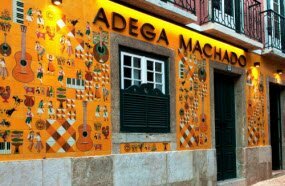 One of the local’s favourite places to enjoy Fado music is at Adega Machado, a little-known about restaurant in the Bairro Alto quarter of Lisbon. It is a little pricey but you are guaranteed an unforgettable night. Must Try Dishes: Whilst in Portugal, you must try Belem Cakes, a traditional egg based pastry filled with custard and topped with cinnamon. You will see these everywhere in Portugal, but for the best quality, you must come to Adega Machado! 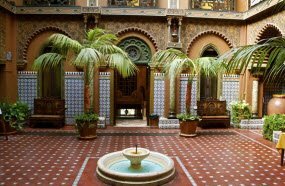 Casa do Alentejo features two rooms, one decorated with handpainted tiles, traditional to Portugal, and the second, furnished with panels from a 17th Century palace. The restaurant aims to keep the Alentejan culture alive through their menu and building. The affordable prices and authentic atmosphere will keep you wanting more. Must Try Dishes: To embrace the Alentejan culture even more, try out the Fried Pork Meet, in Pepper Sauce with Claims and Fried Potatoes. 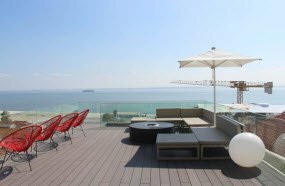 Perched above a hotel, the Wine Bar and Terrace will provide you with unrivaled views of Lisbon city and the Tagus River. The sophisticated wine list and delicious Portuguese tapas combine with the cosmopolitan venue which makes for the perfect afternoon rest, watching the sunset over Lisbon. Must Try Drinks: Try some Sagres Beer, a local and much loved Portuguese beer produced only with natural ingredients. 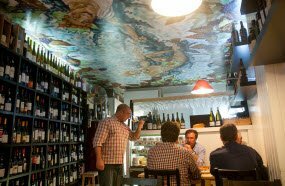 Wine lovers cannot go past this wine bar; the intimate setting, with only six tables allows for a personal experience with the waiters. All waiters are personally trained and will be more than happy to recommend wines and inform you of how they are made and what food to match them with. Enjoy your tastings with cheese, olives and bread, but be sure to make a reservation. Their 4.9 rating truly is for a reason. Must Try Drinks: With over 200 bottles of Portuguese wine choosing just one might be overwhelming so we suggest trying some Port Wine, a sweet red wine grown in the North of Portugal. Port Wine rose to fame during the war; being the English soldiers favourite wine – but the staff will tell you that anyway! Lisbon is a pretty quirky city, but it doesn’t get any better than this five room bar venue. To enter this ex-supermarket, now bar, you must ring the doorbell and be personally let in by the wait staff. The eccentric bar is decorated with thousands of – mostly war themed - antiques, all immaculately presented in wooden cabinets lining the walls. It’s a bit chaotic, but like nothing else – you will love its character. Must Try Drinks: The Magic Star cocktail is one of the best in the 10 page cocktail menu, featuring fruit liquors such as banana and kiwi.